One of my favorite movies is David Fincher's The Game, but before then, I built my own game, a real-life version of the adventure games I played on the computer when I was younger. I've always tried to find ways to bridge the real world with the magical world. I'm not a fan of virtual reality or augmented reality though. The problem is that whenever you take a technology and try to replace reality with some of it, you have to limit reality in order to do so, since computer simulations are not as complex. You become a slave to the computer, a slave to the input device limitations, the algorithmic shortcomings, the poor AI. You also become a slave to the people in control over the technology, who are doing their best to supplant your reality with their own, sometimes not altruistically. So that is the wrong way to go about it. The best way has and will probably always be the same methods used for millennia, the stage or play, the suspension of disbelief. We already have a mechanism in our heads that allows us to see from other viewpoints for short while. Anything more involved traps our consciousness inside a machine. I'm not a big fan of 3D movies, VR headsets, first person shooters, or surround sound. I think high frame rate film removes the magic. I'd rather have 24 fps film and the RogueLike. I'm not a fan of roleplay either and never liked such things when I was a child. I do not get much enjoyment masquerading as something I am not and assuming a new behavior. Instead of wanting to transform myself into a different being, I always wanted to transform the world into a different place. For me, it is hard enough just mastering and understanding one being, let alone many. In one of my favorite videogames SoulCalibur, I played only one character, while my friends would switch between many. It would take a lifetime for me to master just that one character, so there is no need to learn others. My motto has been for some time, "It is not within our power to do everything, but it is within our power to do anything." I am, figuratively, running back and forth, down from the mountaintop to the city in the valley, and back up again. While other people like to stay in the city and mingle. So, one day when I was 25, in 1995, I decided to bend reality a little bit. One month before my friend's birthday, I began designing an elaborate treasure hunt↗. My friend received a blank birthday card. My friend completed the puzzle, and it revealed a pictogram of a modern 35 mm camera + a book, and a number. It also contained a sketch of the floorplan of the house indicating that a some kind of mechanical instrument was in the fireplace. Along with the theodolite were a plumb bob, plumb-line, and symbolic instructions on how to connect the unit to a camera tripod and align it. There was also a trigonometric formula that used the distance of the theodolite sight above the ground (51 inches) in combination with the angle of elevation (84.5 degrees) to derive the distance in feet from the dark spot on the patio to some kind of buried object: x = [51*(tan 84.5)]/12. This distance was 44.13793759 feet, putting it out in the middle of the yard. My friend set up the theodolite on the porch, with the plumb line directly over the dark spot and adjusted its azimuth and elevation according to the message, and looking through the sight, it pointed to a spot in the yard. Digging at that very spot uncovered a container. Inside the container was a bottle of clear liquid, some cotton swabs, and a scroll containing instructions for applying the liquid to the the birthday card. My friend swabbed the blank card with the liquid, which revealed the words "LOOK IN FREEZER", which were written in invisible ink. My friend drove to my house and went to my room, which was locked, and used the key to open the door. Upon opening, the room was completely dark and eerie New Age space music began playing, triggered by the opening of the door. The entire room was empty, covered in black plastic. At the back of the room was a tent-like doorway, a flap of plastic around which light was emanating. My friend went through the door. My friend used the combination provided to unlock the chest. Upon opening, the chest illuminated and chimpanzee sounds came from within the box. 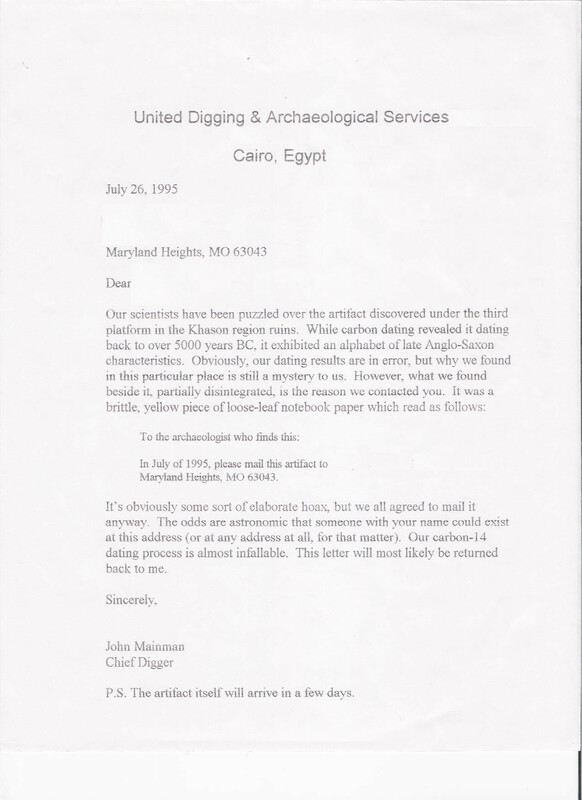 In the center of the chest, was a tiny wooden sarcophagus, painted gold, shaped like an actual Egyptian sarcophagus, a recursive box within a box, with the photo of a real sarcophagus on the outside, and a hinged door. Opening the door to the tiny sarcophagus, wrapped in fabric, with shrieking chimpanzees and space music in the background, was gold. I had to research various invisible ink formulas until I found a rather non-toxic combination of ink and developer. I can't remember what I used. Unfortunately, the ink began to slowly become visible, so when the card was actually opened, the words were faintly visible. I built the puzzle by cutting a wooden board I had painted and decorated the envelope to look like it was mailed from another country. I built the theodolite by researching surveying instruments and using trigonometry. I studied older machines utilizing plumb bobs (simply a weight and some string) to calibrate elevation. I used a protractor to create markings for azimuth and elevation on cardboard. I rolled a paper tube to use as the sight, affixed it to a wooden board. I used the property of the tangent and right triangle (opposite over adjacent) to develop the formula for the distance in feet. My friend, however, couldn't find the spot at first and had to dig around, eventually finding a patch of recently dug grass. The ice block was made by freezing water in a plastic container in stages, so the plastic capsule sat in the middle of the block of ice. My friend said it took a really long time to thaw the block, and I think the plastic capsule leaked water. The floppy disk simply contained a batch file I wrote to work on my friend's IBM PC-Compatible computer. The space music and chimpanzee sounds were done by triggering electrical switches when doors were opened. I affixed a stick to the light switch on the room door to trigger New Age music from the library on a stereo-cassette player when the open door hit the stick, and for the metal chest, I created a switch out of foil to trigger a light bulb and a small cassette recorder with African animal sounds, which was placed at the bottom of the box. The chest was a metal toolbox that was able to be padlocked. I created a program on the inner sanctum computer (a #Commodore64) to only allow a password that was equivalent to the result of the tangent formula, or any value rounded down to the nearest foot, since I didn't know how precise my friend would measure it. I carved the sarcophagus out of a small block of wood in one piece, using a table jigsaw, except for the top and bottom. I added hinges and cut a postcard from the St. Louis Art Museum of a real Egyptian sarcophagus to use as the top cover. The entire game was a surprise, so I had to prepare well in advance. After I finalized the designs, I began building the objects and writing the storyline. I had to move all of the furniture out of my room and move it back in again, a big hassle. I covered the whole room in black plastic sheeting, using hooks and nylon cord to keep it against the ceiling and create the "holy of holies", the room within a room. I debated doing all of this work, but it was the only way to transport the mind into a different reality. A room, like a stage set, or any space that one is familiar with, is defined by the objects, dimensions, and colors. If you change them, the space becomes an entirely new place, not just figuratively, but literally. The only thing that hasn't changed is its relative position to other rooms. But this is not a problem, as passing through the door is like stepping through a portal to another dimension. Like a magician using an inside helper, I contacted my friend's sister who agreed to let me in to place the objects ahead of time, even digging a hole in her backyard. I had to set up the theodolite and point it to a spot on the yard, then take measurements before digging the hole and add them to the instructions I placed alongside it in the fireplace. I put the package under a piece of furniture so the edge was barely sticking out. Later, I left, and when my friend returned home, I stopped by and delivered the birthday card, then said "Hey what is that package under there?" and pointed to the package, and then said I had to go and hurriedly left. It was very funny. The whole thing was not outside the realm of possibility, as it wasn't me, per se, that was behind it, but my "future me", 12 years later, that was doing it without my knowledge. So I could go about my business and claim I had no knowledge of this game--there was no need to hide. I've always been interested in this type of time travel, future selves interacting with present selves, and I played a lot of graphic adventure games in the 1990's that contained these elements. I made a short film on this concept once, and have always found these kinds of films fascinating. Nacho Vigalando's Timecrimes (2007) or the Brazilian O Homem do Futuro (The Man From the Future, 2011) are more recent examples of this. Even though it was obviously a game, keeping the whole thing logically possible, even if ridiculously unlikely, makes you feel like you really were part of an amazing story. So overall, I combined many ideas that fascinated me, such as the idea of finding the Ark of the Covenant, or following in the footsteps of Icelandic alchemist Arne Saknussemm in Jules Verne's Journey to the Center of the Earth or the videogame Myst, or ancient advanced civilizations, using mathematics and simple machines to solve problems, cryptography and stenography, archaeology, cartography and surveying, and my fascination with chemistry and physics (invisible ink, phase change of water, gravity of plum bob), electronics, recursion (room within a room, box within a box), time capsules↗, and elements of InteractiveFiction and the DungeonCrawl. Now that I think about it, it was a bit steampunk in spirit. Nowadays, there is a popular game called geocaching↗ that a lot of people play, but we didn't have that 24 years ago. If I had had GPS available back then I probably would have used it. What differentiates this kind of thing from a traditional game, is that it is, in part, real. Someone actually did interact with the real world to find a real treasure, based on a premise that was in the realm of possibility. But it wasn't real enough. I keep thinking about this, I keep thinking about how we can really bridge our imagination with the real world, in a way that doesn't destroy our own humanity. Late 20th century science fiction authors wondered what would happen if we entered a computer simulation, a virtual reality. But technology companies in the 21st century are trying to do the reverse, insert tiny computers, cameras, and sensors into a Network of Things, and even ourselves. Those same authors, however, also showed us how this might be stopped.